A1-Pools and Spas is the most popular Swimming Pool Repair Renovation Company proudly serving Pa & Nj Pool Owners since 1967. 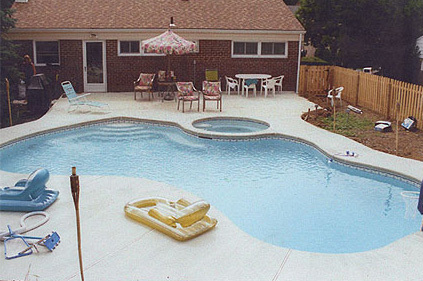 We provide immediate service for every type of Inground Vinyl Liner, Fiberglass, Concrete Pools and Hot tub whirlpool spas. We are State licensed and Certified for all types of Residential and Commercial Pool Repair Renovation Applications. Many Real estate companies utilize us to perform pre-settlement Pool Inspection Certifications. We also perform inspections for homeowners that have experienced Storm Damage to their Pool/Spa for the handling of insurance claims. Remove water from behind floating liner. Retrowl Sand or vermiculite bottom from washout. *We provide Above Ground and Semi Inground Pool Packages complete with Installation. A1-Pools and Spas staff has extensive training and will find the leak source and repair it. Who Uses A1-Pools and Spas? Major real estate companies seeking inspection certificates such as Weidel, Century 21, Allen Realty, ReMax and many more. Bucks, Hunderdon, Somerset, Middlesex, Mercer, Berks, Montgomery, Philadelphia, Chester, Salem, Gloucester, Camden, Burlington, Cumberland, Sommerville, Easton-Phillipsburg, New Brunswick, Sub.Trenton Princeton, Doylestown, Quakertown, Emmaus-Kempton, Allentown, Bethlehem, Lansdale, Norristown, East Montgomery County, Lower Bucks County, Trenton, North East Philadelphia, West Chester, Coatesville, South Chester County, Salem, Woodbury, Phoenixville, Somerville.